Is there room for improvement in your life? If not, stop reading. If so…are you willing to do something to get that improvement? If not, stop reading. Sometimes coaching clients come to me knowing exactly what they want and need and sometimes they come to me with just a vague knowing that there is ‘something more’ out there but they don’t know what that ‘something more’ is. The latter is how I was when I began being coached more than a dozen years ago. 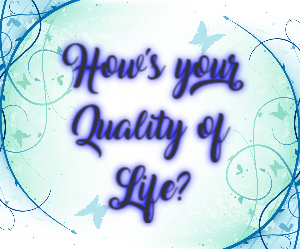 The Quality of Life assessment is one that I use frequently with my clients and I thought it might serve you to have this assessment for yourself. Of course, doing the assessment is just part of the process, how you act on the information is where the juicy stuff starts happening! Whether you invest in a professional coach, work with a partner or bring together a group of like-minded people to help each other attain your respective goals, this tool can be very helpful – enjoy it with my compliments and best wishes for continued growth as we approach the second quarter of 2019! This entry was posted in Empowerment, Newsletters, Personal Growth, Positivity, Stress Management, Wellness and tagged e-news, Motivation, Quality of Life, Your Life Unlimited. Bookmark the permalink. Extremely interested to participate in the Quality of Life assessment.